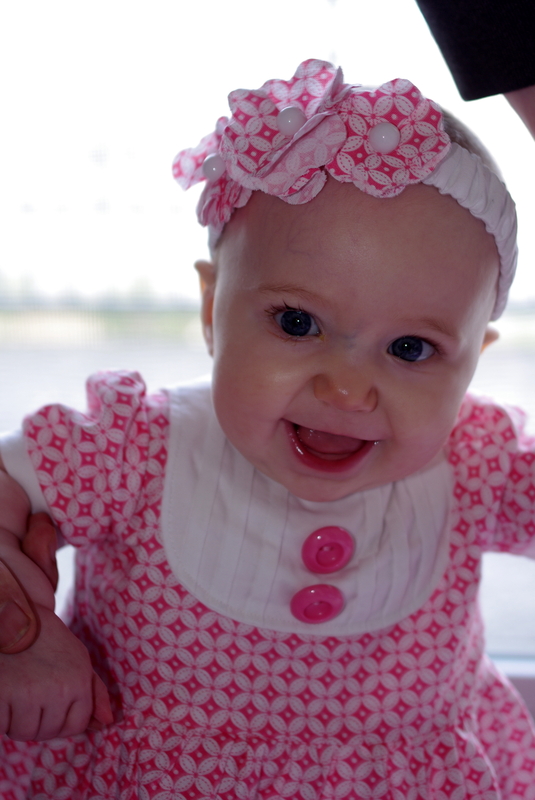 Hannah turned nine months old a little over one week ago. 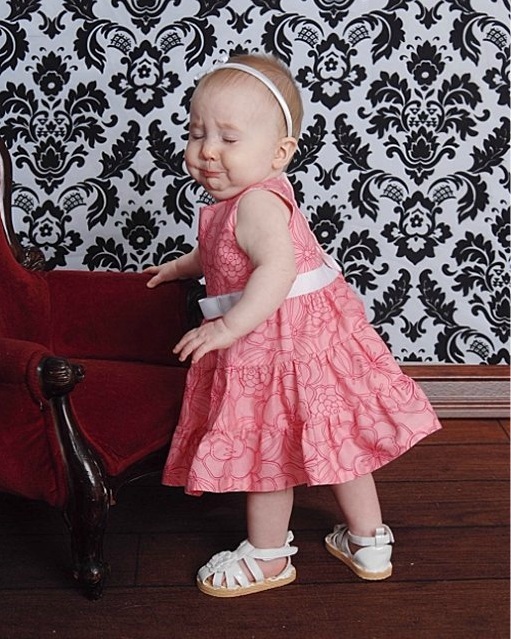 My birthday and her nine month birthday were actually on the same day. It was a lot fun to celebrate together. 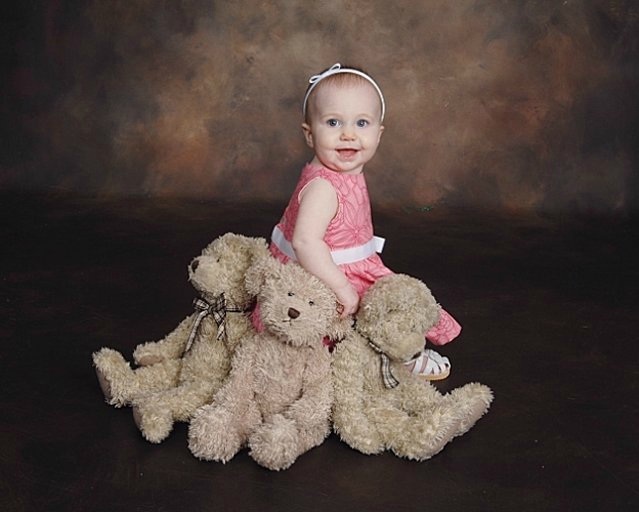 I took her to get her milestone pictures the next day and I think we got some good shots. 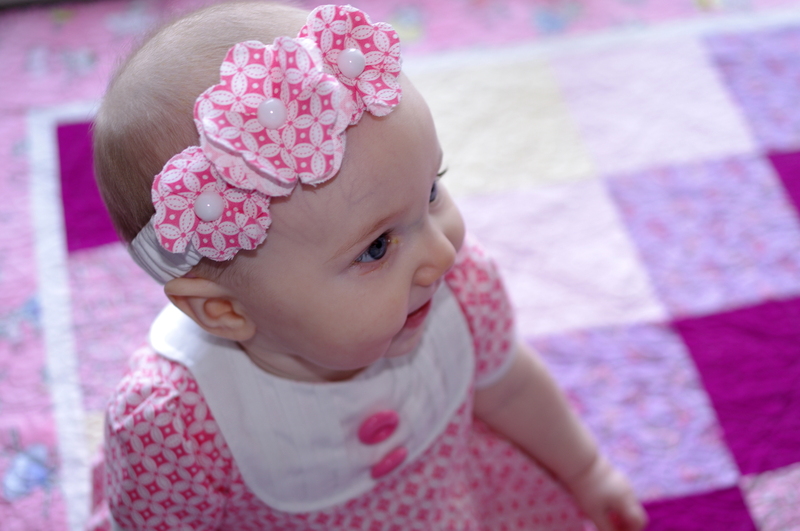 She wore her tiered Easter dress and I made her a matching headband. The headband was a cinch! No sewing, I just glue gunned a little grosgrain ribbon bow to a plain headband to match to the one on the bodice of her dress. The headband I bought from Target around Christmas time. They came in packs of three—one white, one red, one green—for one dollar! 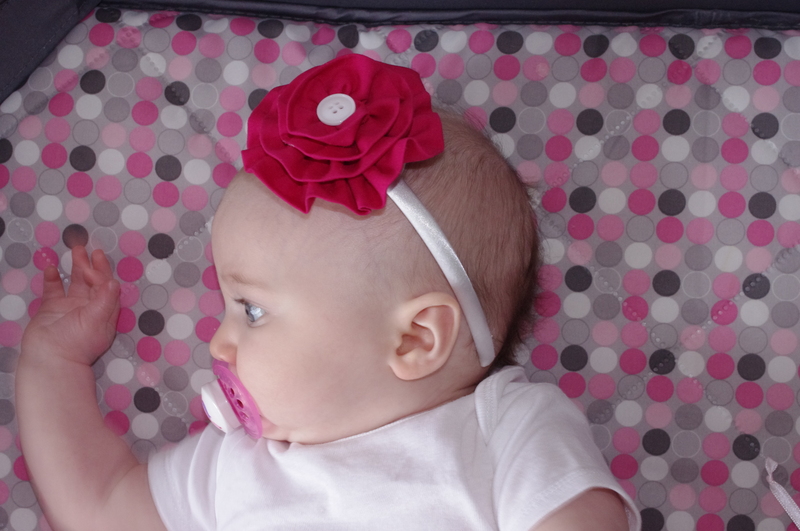 The next time I see headbands for one dollar, I’m going to buy like a bazillion. 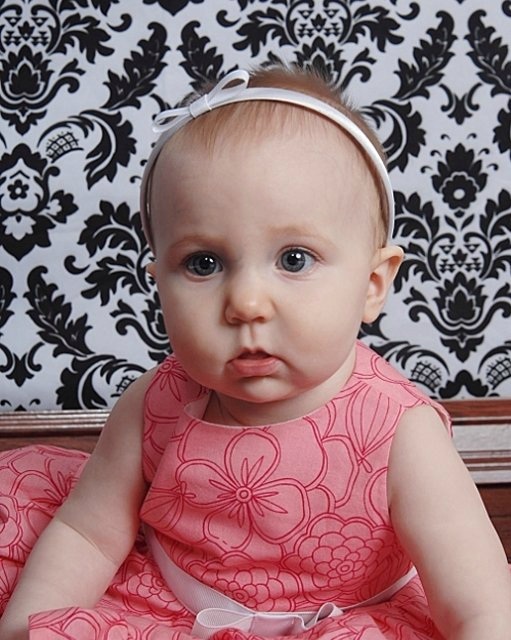 Although Hannah wasn’t really in a smiling mood, I think her serious expressions are cute too. This picture is the only smile we got. I guess that is what happens when pictures get a late start and end up during nap time. I love this one. She looks so elegant and the dress is fanned out so beautifully. When I was sewing this dress, I started to think that maybe I had gone a little overboard with the ruffles and that it was too floofy. In the end, I think the floofiness looks great and the extra fabric allows the skirt to fan out like a circle skirt, which is ideal for pictures. The meltdown picture! 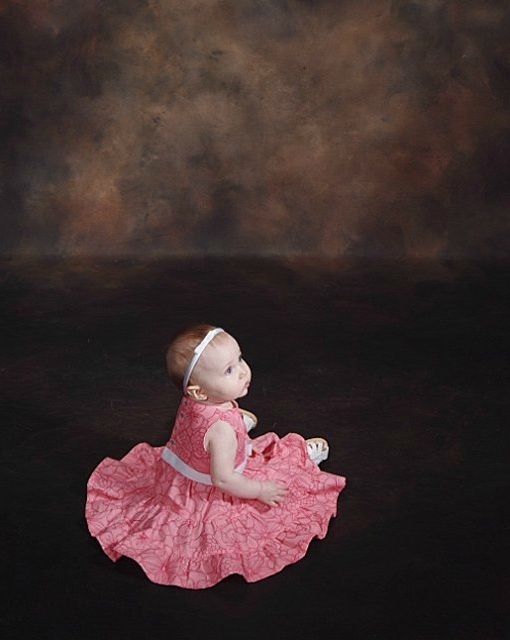 By this time a nap was long overdue and Hannah decided that pictures were definitely done. This one is so cute, though, I was seriously tempted to order one! 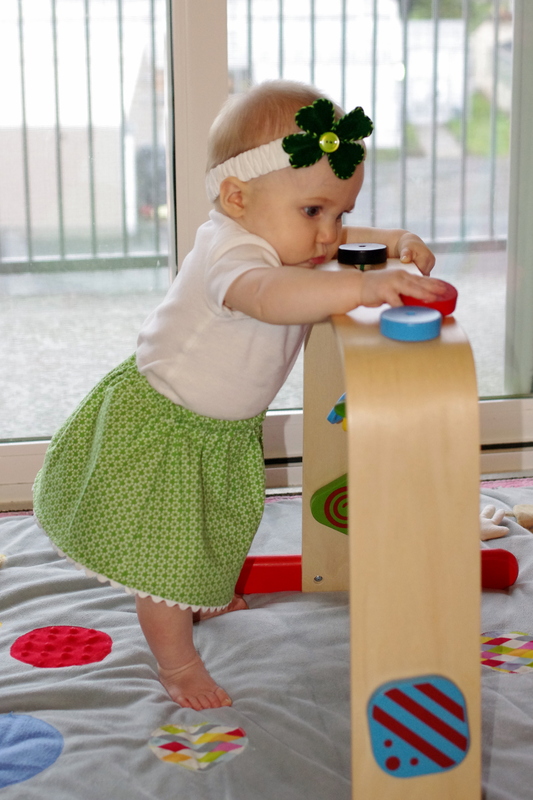 This past week I participated in the Emma Dress sew-along, my very first, on the Craftiness Is Not Optional blog. It was so much fun and this is the result. Although I usually gravitate toward pastel colors, I decided to go out on a limb with this bold floral pattern on a charcoal gray background. 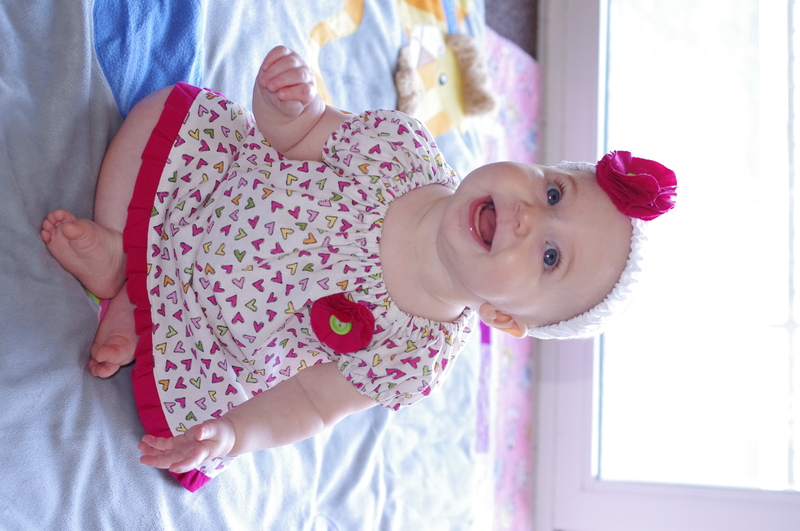 I think the little one looks super cute in it, even though it is definitely out of my color scheme comfort zone. This project was a fun challenge. I learned so many new skills and really surprised myself with all of the things I was able to do. 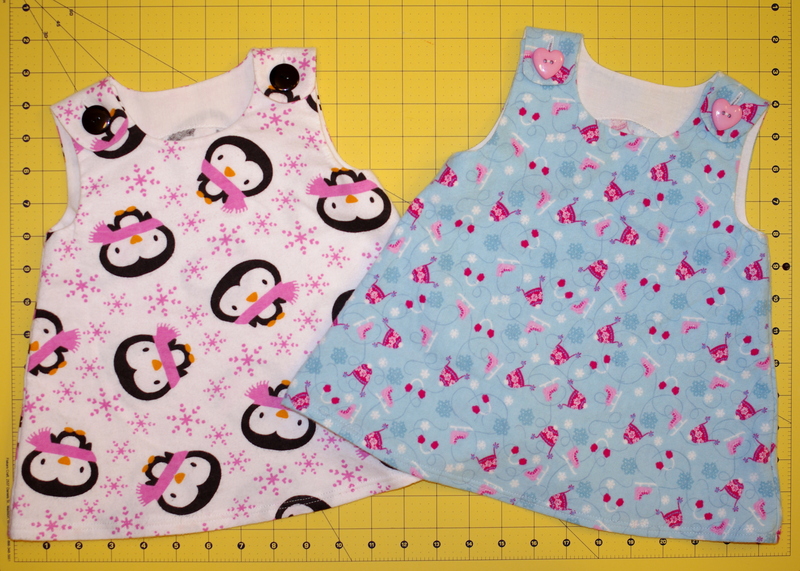 First off, I didn’t use a store bought pattern or a free pattern from a blog. I didn’t even modify an existing pattern. 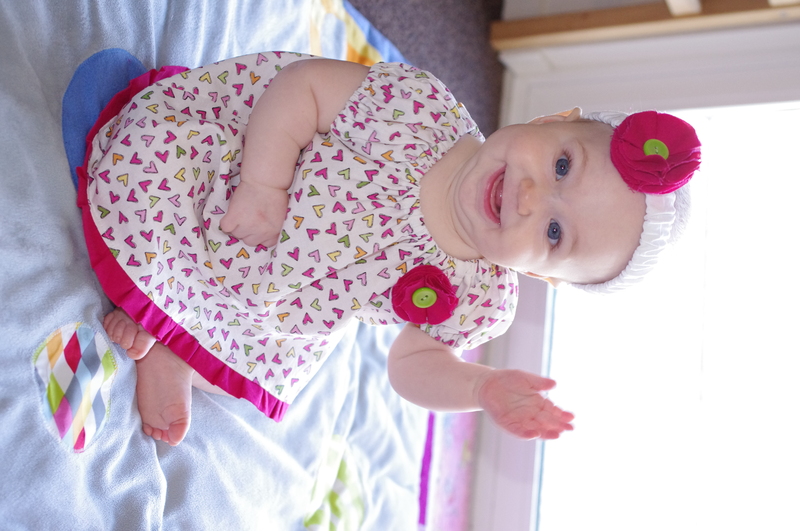 I made my very own pattern…and it worked!!! It is such a great feeling and now I feel confident enough to maybe try to make some original creations. Maybe…. Another new thing, sewing with ric-rac. Luckily it was not the nightmare I imagined it to be. I am proud to say that I never had to rip a single seam related to the ric-rac! I thought it was going to be really challenging and thought that I might have to scrap the ric-rac altogether if it got too complicated, but to my surprise, it was a total success. 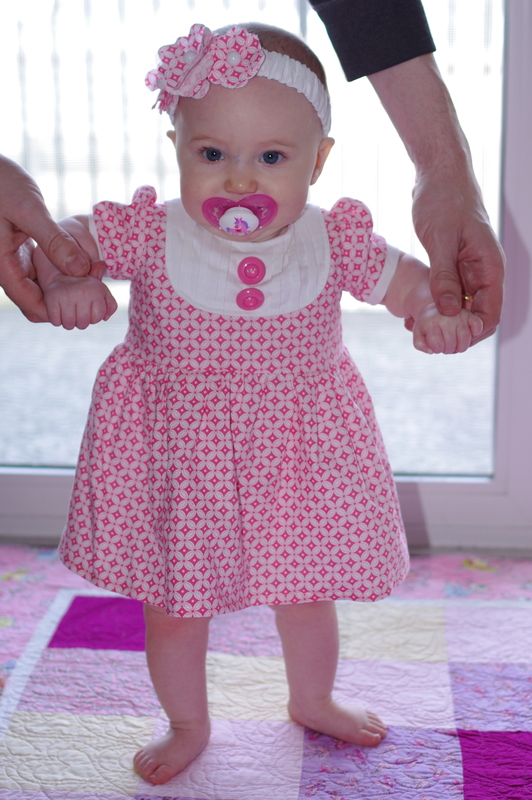 Yet another skill to add to my sewing arsenal : ) And one more adorable pic of my cutie pie in her new dress. 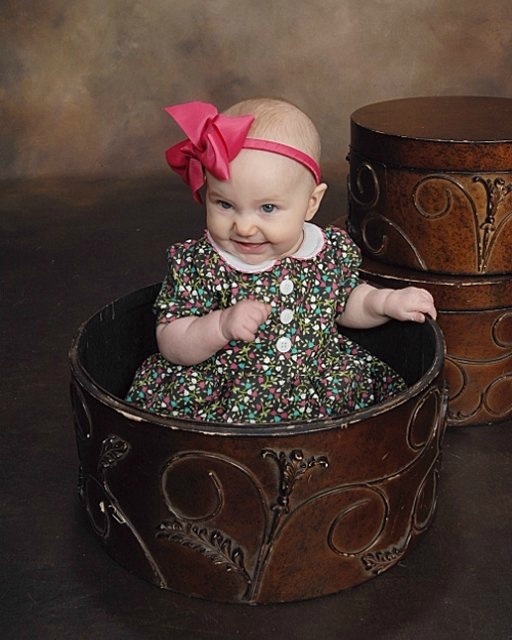 (She’s looking rather mischievous in this one.) 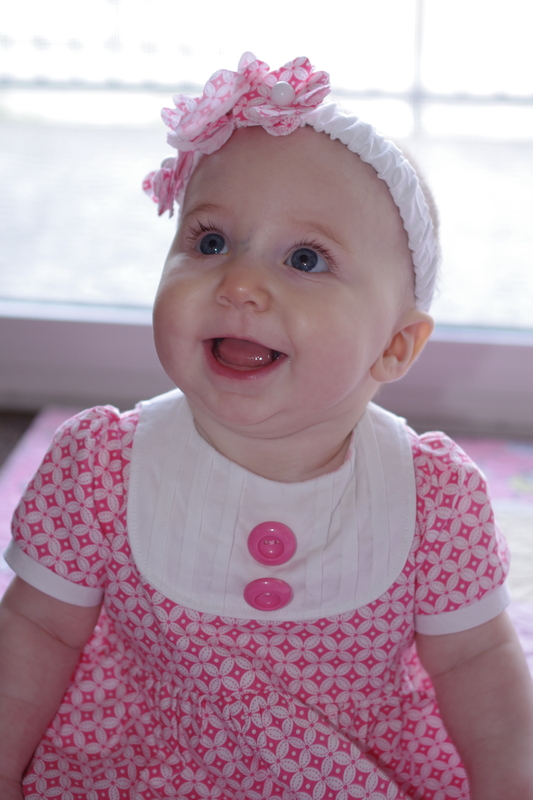 I can’t believe that she turned six months old on Sunday. How the time flies. 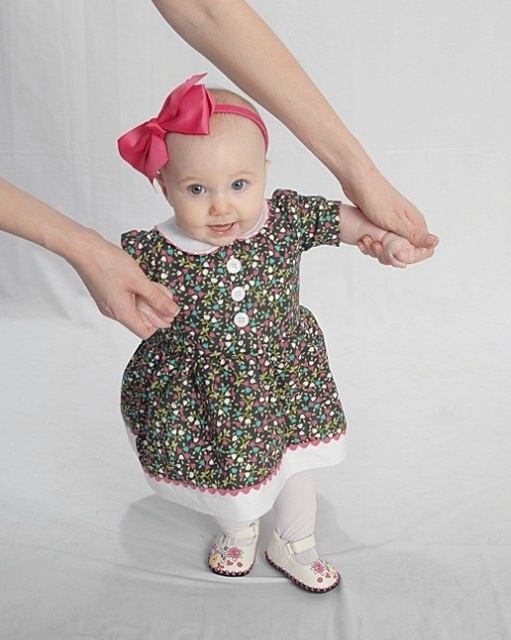 The real debacle in this whole sew-along and six month pictures business was not the pattern making or the ric-rac as one would imagine. It was the runway headband. 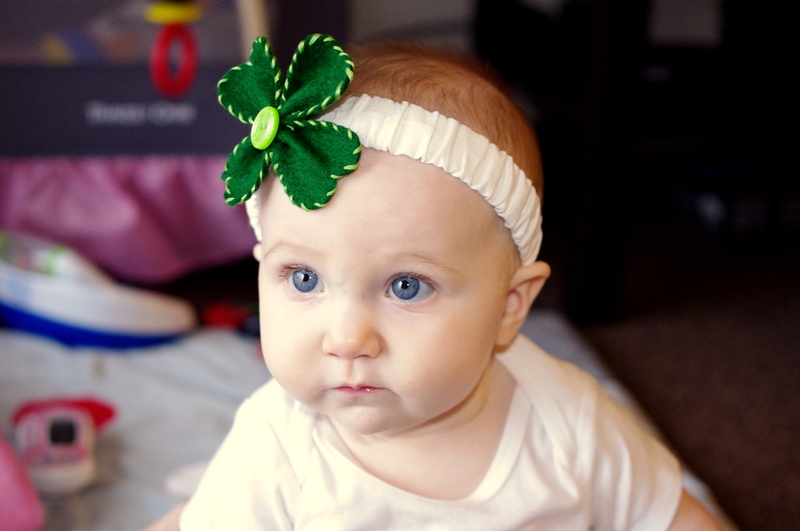 So, I made a headband for the little one. I put it in the front pocket of the diaper bag when I was hurrying out the door to get her pics taken. When I got to the studio, the headband was nowhere to be found. I went back to the car to look for it. Nowhere. I was so annoyed because a headband is a must, both for the cuteness factor and also because she doesn’t have much hair on top. I called my husband and he found it in the hallway outside our apartment. Thankfully I mentioned the runaway headband to the lady at the studio. She told me not to worry and pulled out a whole box of different styles and colors of headbands! Photographer to the rescue! 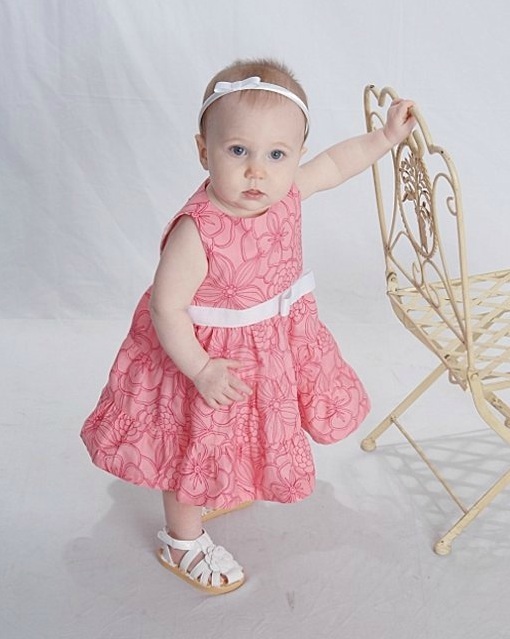 There was a bright pink bow that matched the dress. Crisis averted. 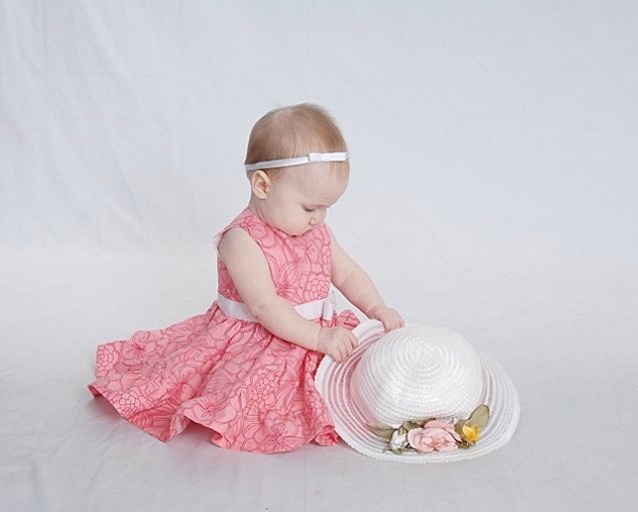 Even though the flower headband didn’t make it into the 6 month pictures, I suppose it deserves an honorable mention. 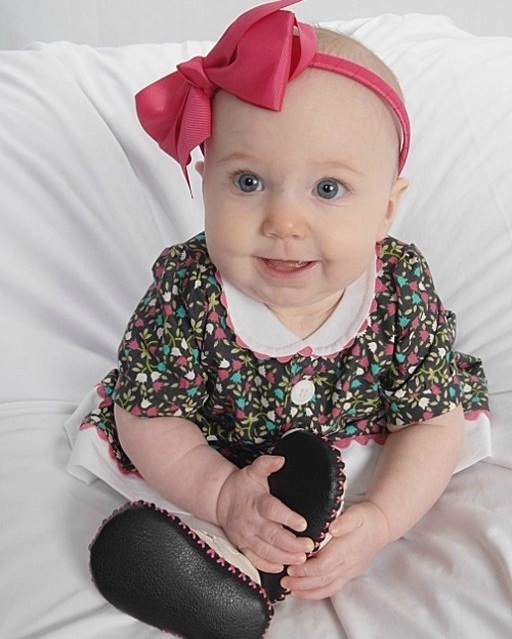 Happy six month birthday to my sweet little girl. The headband was sort of a last minute thing. 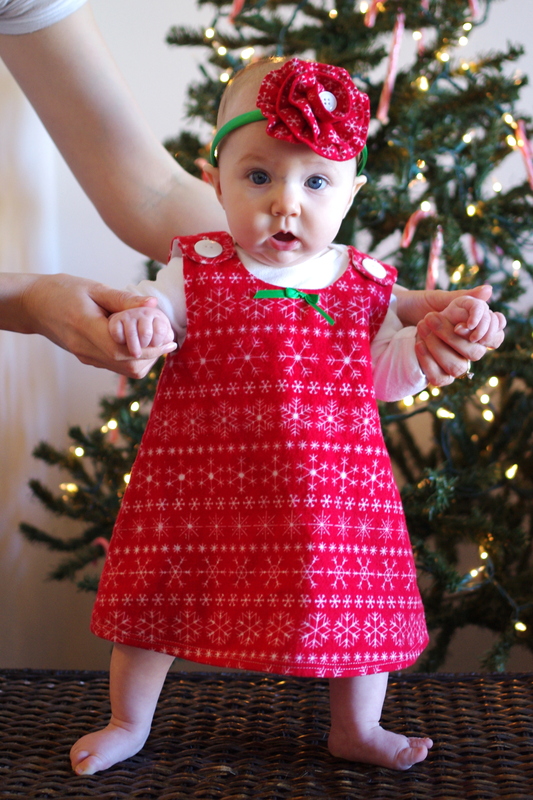 It’s amazing how far one yard of fabric can go with a 5 month old, so I was trying to find ways to use up as much of the fabric as possible since it’s Christmas themed. 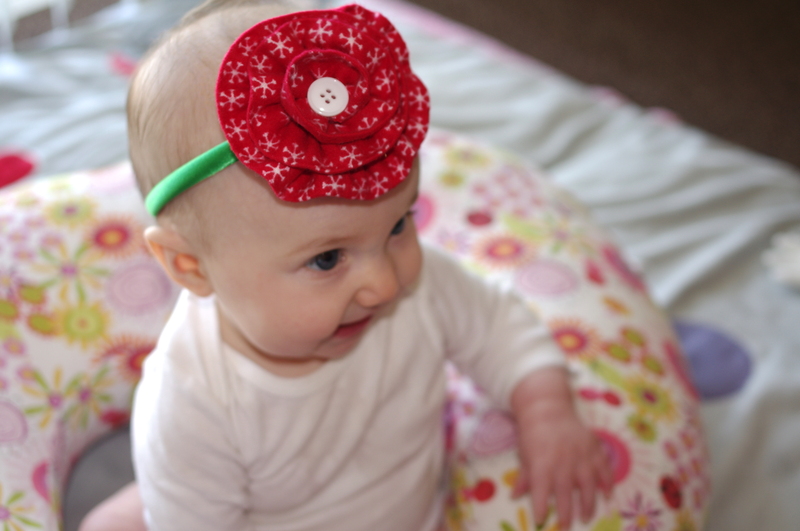 Obviously a matching headband was necessary : ) The whole red and green thing is a little over the top, I know, but why not for baby’s first Christmas? 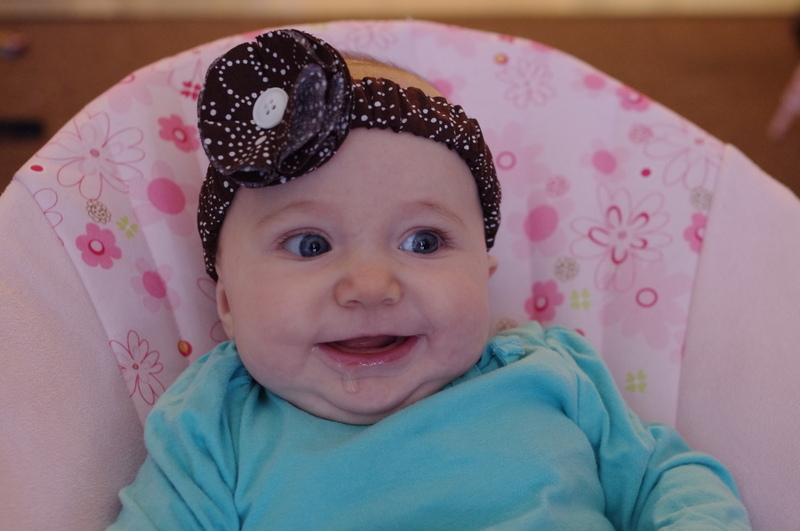 The amazing thing about the headband is that I found it in the Target $1 isle in packs of three. What a steal! I bought a few packs of them but was a little bummed that they were too big for her. Oh well, I went for the oversized headband look anyway. I think she pulls it off well. I also made two other jumpers, which are very cute. So far no matching headbands for these. We’ll see if I have time before Christmas travels to pull something off. The one gripe I had about making these jumpers is that creating button holes and sewing buttons on is a pain in the you know what! Hopefully it will get easier and quicker with practice. 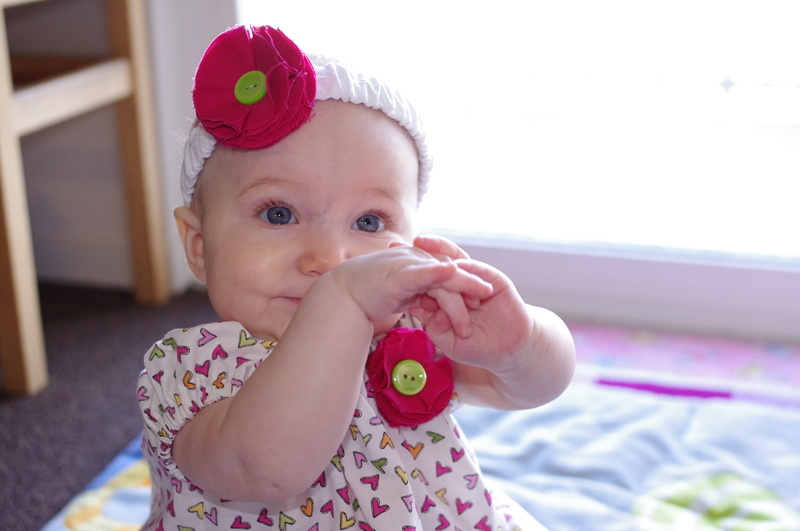 With the leftover fabric from the nursing cover I made for my friend, Charlene, I made a flowered headband for her cutie pie daughter who is only 6 weeks old. My little one has so kindly modeled it in the picture above. Please excuse the puddle of drool. I’m pretty sure we’re in teething mode now. It looks like she might be working on both bottom teeth. We shall see how things go.